With the year half over, it's a good time to evaluate your business and your life. Take a moment to evaluate where you are in business and in life. 00:18 – Are you living the life you want? …if you’re not happy, then do something about it. [Click To Tweet]. You know learning to ski is a lot like Internet marketing. [Click To Tweet]. Hey, James here and you probably guessed I’m at the snow today and yes, we do have snow in Australia. Are you getting the results that you want? Is the life that you’re living what you envisioned? Are you happy with it? Because at the midway point during the year, it’s a great time to have a look at these things and if you’re not happy, then do something about it. James here with a ski update. Things are going well; exhausting but fun. So here we are in the chair lift on the way back up to the top and it is just a beautiful day here. You know learning to ski is a lot like Internet marketing. It can be difficult, it can be expensive, and it can get a lot further down the track if you have lessons. There will be times you feel like giving up but when you push through, it’s absolutely worth it. So have a think about how this applies to your business. If you happen to have an online business, I’d love to help you. Right now, you can join either SuperFastBusiness.com where I’ll coach you everyday, or SilverCircle.com if you have a six- or seven-figure business. That’s where I can get significant results for you as I have with others. Then you’ll be able to get what you want. So what do you think about that? Perhaps place a comment right near this video about what you are going to do to change the rest of your year from now. I look forward to reading and responding to your comments. I’m James Schramko. Question: Have you done away with the video flash intro for your super fast business logo on all your videos? I’ve noticed text in the beginning that depicts the topic of video. Hi Carol, when I use the flash intro it is after I introduce the topic of the video. (A few seconds in). I usually always put the outro as well. The text at the start helps people choose to watch. I’m going to make a move out of my ‘comfort zone’ here in Adelaide in to a completely new environment in Sydney in August! Will finally get a heap of videos up and expand my product range, get cracking with email marketing and focus on conversions. I think focusing if I focus on one thing at a time rather than trying to do everything things will get ticked off quicker. Cheers James! James, you need swap thew skies for snowboard. I spent the last week at Perisher and I can tell you based on the whole week I was their, that Snowboarders are a more social and caring bunch of people. I learnt the quicker I go back up from a stack the less likely I was to repeat the same mistake and would try different things. Yes I even took a lesson from a professional to improve my skills on the slopes it was a lot quicker than failing down and getting up by myself and she showed me how to ride a t-bar instead of it riding me. Much like internet marketing you can have these awesome systems in place and become a slave to them without the right kind of guidance you can master them so they work for you instead of the other way round. Great video James keep them coming! Thanks James for the update video. Great content and came at perfect timing. 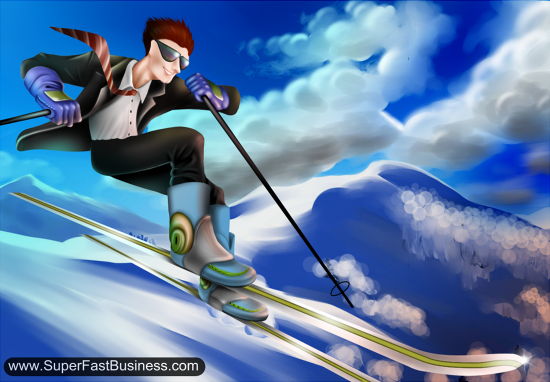 Loved the analogy how internet marketing is a lot like skiing. James you should come over in Jan or Feb 2014 to Japan to experience some seriously good snow. Watch your skiing or boarding really take off when you have the right platform. Glad you enjoyed your trip. Sean sounds perfect! Japan is an option. You are so right learning to ski turns so many “parallels” to business and life’s learning skills. If it all gets to hard you can have a hot chocolate to think and engage, adjust and tackle it again! Keep up the ski practise James, its a wonderful sport on so many levels, no mater what level you are at. Thanks James. I will work on it! just back from Japan (in summer), very cool place, great for a holiday. In some ways the most developed country! Kids loved it. I’d like to visit Japan Ben – way cool! Preparing to turn 40 is almost enough to change the rest of my year. Finally following through with my ideas and completing projects is how I will change my year and life. Grab a snowboard and come over to NZ, best skiing in the world this time of year. NZ, Japan or Whistler for sure next time. Thanks Christian.